I keep a little footheater in the studio (in addition to the three fat puggies who occasionally serve that purpose). This painting, Winter Study, makes my toes cold. In a few weeks it will be Christmas and I can hardly wait for the time off work. By day I am a mild mannered bookwormish editor for a medical journal in Dallas. By night, an intrepid painter, splattering turpenoid on the studio rug with wild abandon. It's a challenge sometimes having a "day job" and a night job in the art studio, but it's also a joy to have the balance that painting brings to my life. Mix in three fat puggies to keep the laughter coming, and a husband who likes cooking so I no longer live on M&Ms and fritoes alone, and life is just about perfect. I hope all of you have things that bring you little joys in life and balance, too. 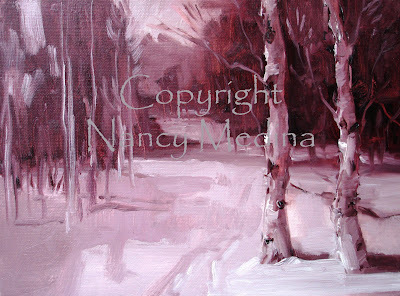 i love this winter study! Emmitt and I are so lucky to have a wonderful friend like you. you and your puggy gang bring us lots of joy! Thank you Melissa - our winter joy would be complete if we had just a little snow. You and Emmypants stay warm up there in coller-radoe! You always have a wonderful way with words. No wonder you are an editor. Okay, we've studied winter long enough. Can we just go right into Spring? With warm afternoons? In the mean time, what a lovely painting. It could be anywhere in New England. Lovely painting Nancy! I can't believe you can get all these paintings done and have a day job! You go girl! Ooo, I love this! So beautiful! Lovely monochrome painting with all the feeling - if not more - of a painting in full colour. Join me in France, Italy and online! Five years ago, I quit my corporate job as the director of a national magazine to become a full time artist and art teacher. One morning I had an epiphany: Life is too short not to follow your bliss. Every day I wake up and my heart surges with happiness. Yes I am an artist. Yes this is what I do for a living. Yes, I am a lucky girl. Thank you to each of you who have walked with me on this path. Whatever your tomorrow brings, may it be filled with color! Look Who Follows This Blog! Check Out My New Video! © 2013 Nancy Medina. Awesome Inc. theme. Powered by Blogger.